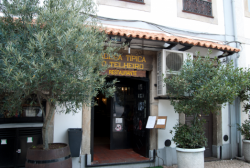 O Telheiro Restaurant is a delightful restaurant located on a quiet street within Aveiro old town, close to one of the town’s many picturesque canals and the famous fish market. 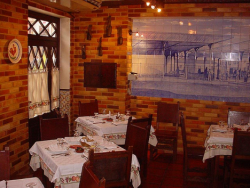 This is a long-established restaurant, as popular with locals as with the many visitors who come from all over Portugal and far beyond to discover Aveiro’s delights. 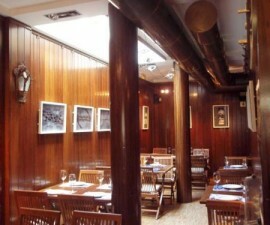 Stepping into O Telheiro Restaurant is like stepping back in time to Portugal in its seafaring heyday. There is a distinct maritime feel to the restaurant, with lots of carved, dark wood décor and furniture, fishing nets strung from the ceiling and blue and white azulejos — hand-painted ceramic tiles — recreating the colours of the sea and sky. Pots, pans and cooking utensils complete the décor with a taste of traditional Portuguese gastronomy. 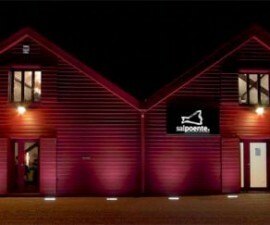 The dining area is divided into two, with a large, more formal dining room to the back and a front area open to the grill, enabling diners to watch as their food is carefully prepared in front of them. As you would expect of a restaurant that is happy to put its cooking so readily on show, the welcome at O Telheiro is warm and friendly, whilst retaining a level of laid-back charm. The food at this Aveiro restaurant is traditional Portuguese, embracing hearty ingredients from land and sea — fish, caught locally and sold at the fish market; meat reared in the hills and valleys of central Portugal; and delicious freshly picked vegetables. There is a wide choice on the menu and the seafood rice, cod and grilled fish are all notable for being well prepared and extremely tasty. Dishes here are also great value for money thanks to the generous portion size. In fact, for a lighter meal, it is quite possible to share a whole portion between two or request a half portion for one. 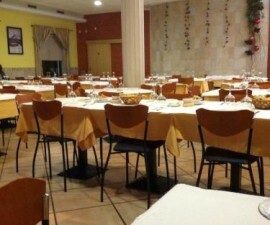 This makes dining at O Telheiro Restaurant very cost effective, on top of the fact that its prices in general are slightly lower than many other Aveiro eateries. Desserts are freshly prepared in house and there is plenty of choice on the wine list, making this the perfect stop for a full three-course meal with all the extras. O Telheiro is open from midday to 3:30PM for lunch and from 7PM to 11:15PM for dinner, Tuesday to Sunday. Closed on Tuesdays.